Surveyor is easy to use and has all the features you need to reliably and automatically water your course. Irrigation scheduling is simple. 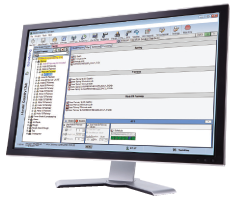 Runtimes can be adjusted manually or determined automatically using an ET sensor. Surveyor offers two types of water management—flow-optimized and FCP or field controller program. When flow optimized, electrical and hydraulic demand are efficiently managed to ensure your watering window is as short as possible. When you use an FCP you have total control over when, where and for how long sprinklers run—perfect for overseeding, seed germination, grow-in and other cultural practices where optimal use of the pump station is a secondary concern. 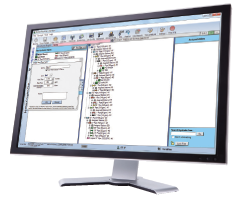 The Task Scheduler automates daily tasks to simplify irrigation management even more. Managing your irrigation has never been simpler. Name your schedules for what they water. Group them by the types of turf they manage, where they are on the course, or anything you think is convenient. If you prefer the flexibility of individual sprinkler control, Surveyor even lets you drill down to the sprinklers themselves and adjust runtimes, cycle times and more. When you make changes or disable schedules for individual sprinklers, Surveyor reminds you of the changes so you can return to them later without hunting through all your schedules. Surveyor uses your electrical and hydraulic data to efficiently balance sprinkler demand while maintaining flow at safe velocities. To protect your pump station and maintain optimal sprinkler uniformity, irrigation can be gradually stepped up in safe increments. The interactive color-coded flow graph shows where and how much water is used throughout the night’s irrigation cycle. 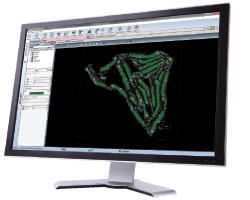 Create and edit controller schedules while out on the course. With Surveyor, critical irrigation is not dependent upon the whims and availability of a computer or communications link where it is subject to a single point of failure. Surveyor software creates schedules then sends them to the field where controllers do the actual watering. Because Hunter field controllers are packed with intelligence, you can even create and edit schedules out on the course and transfer them back to Surveyor for review and editing. Surveyor even checks with every controller to see exactly which stations are running to show them graphically on your map or list them for quick review. Extend equipment life, shorten your watering window and prevent low pressure problems which reduce uniformity and cost you money with Surveyor’s easy-to-use hydraulic modeling feature. Although the setup is not required for basic irrigation, when used it unlocks the true power of individual head control by maximizing system flow while maintaining safe velocities across the entire pipe grid. 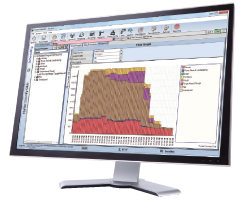 Surveyor includes a customizable library of common pipe types and characteristics and uses your hydraulic map to determine the fastest, safest way to schedule each day’s irrigation. 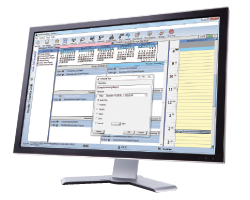 Surveyor’s incredible Task Scheduler is a calendar used to automate tasks throughout the year. Anything from pop-up reminders of your fertilizer schedule or tournaments to downloading irrigation schedules. 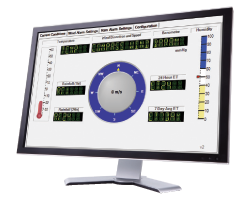 Task Scheduler can be set to check the weather station, get and apply ET, monitor sensors and even suspend irrigation for important events. 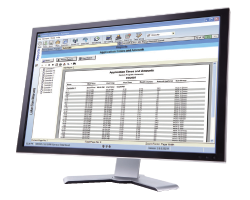 Surveyor includes attractive, readable and printable reports that can be customized for information that matters most. See if there were any problems with field controllers and what they were. Use the Make-Up Watering feature to determine which sprinklers failed to run as a result of sensor or other conditions. Then, use that report to automatically water only those stations. Add a TurfWeather station to tie your irrigation to the weather. Progressive water-saving and climate-sensitive automation features including weather tracking and automatic ET provide the ultimate in scientific turf management. The multi-functional weather display shows temperature, wind speed and direction, barometric pressure, rainfall and ET. The information, is used by Surveyor to schedule irrigation runtimes by application amounts or percentages of ET. Adjustments can be targeted to the entire course, specific plant types, holes, areas and even individual sprinklers.